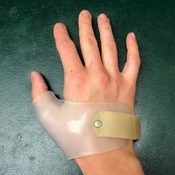 A wrist-hand orthosis (WHO) is a general name for a brace that encompasses the wrist, hand and forearm. There are many types and may or may not contain articulated joints. Its design depends on the type of control or correction that is to be applied. There are two main types of WHOs: static and dynamic. Static WHOs are used for preventing contractures, immobilizing and positioning while dynamic WHOs are used to assist with daily activities and allows for varying degrees of motion at the wrist. 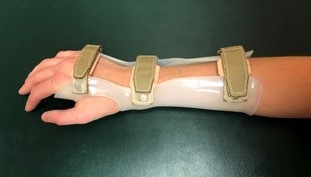 The orthosis can be made of high temperature thermoplastics or leather and foam.